A heatwave brought daily highs into the mid to high nineties in Northern Baltimore. The Gunpowder, which has leveled out at an ideal 150 Cfs between 50-53 degrees, is a perfect place to cool down on a hot day. 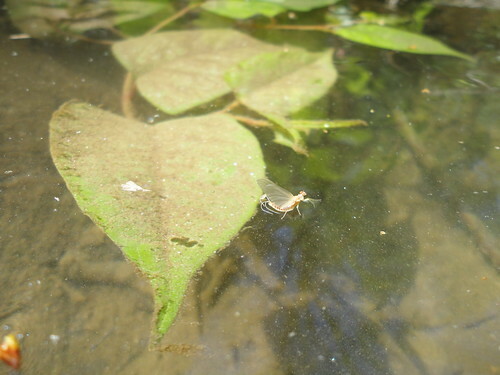 The recent gate change last week has created more opportunities for anglers seeking hatching bugs and dry fly fishing throughout the day. Reports from guides, clients and anglers over the weekend detailed good morning and midday fishing on the surface. The evenings are still best, but fishing for a few hours at any time of day can be productive. 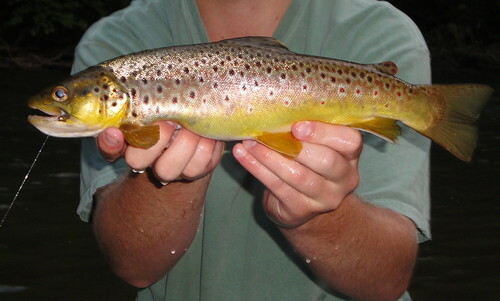 Fishing nymph tandems under an indicator or swinging wets will yield more fish, and larger browns. 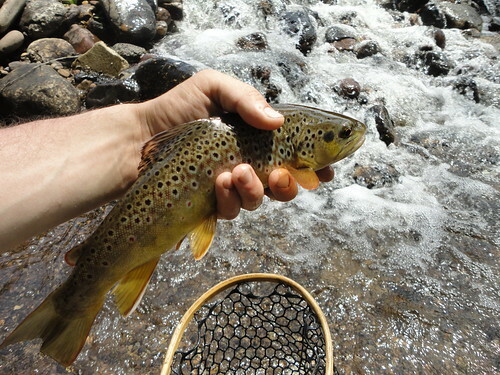 The brown above was caught by Alex McCrickard, a few days before he left for a Summer of guiding in Wyoming. Here are some photos from the past few days on the Gunpowder. I caught some nice fish during the sulphur hatch including this 15 inch brown last night right before dark. The sulphurs are now a size # 16 – 18. Nymphing with a size # 16 or 18 hares ear nymph has been deadly in the afternoons. This entry was posted in fishing report on May 31, 2011 by Jason du Pont. I’ve watched the USGS gauge fluctuate on the Savage River all Spring, and finally found a window to go fishing. I was on the water at noon on Tuesday, as the Savage dropped from the 250 CFs range. The higher water makes for some great fishing, especially throwing dries in the pockets. I arrived, rigged up a sixteen foot 5X leader, and tied on a size 12 snow shoe march brown. I started in a rough water area, fishing the small pockets behind boulders, and where the soft seams meet the fast water. The trout were looking up, and I rose quite a few, but landed 6 fish by dinnertime. I took a quick break, and rigged a streamer on another rod. Two deep pools looked like good places for big fish, so I worked them thoroughly with a sink tip. The first pool didn’t give up a strike, but the second pool left me walking away defeated. Twenty minutes without a strike caused my attention to wane, until something pulled the line from my hand between strips and started taking line off the reel. I didn’t feel a strike, just instant fish running drag. The chase was on as the rod bucked violently. I adjusted the drag, kept pressure on the fish and much head shaking ensued. The strength, weight and bend in my rod made me realize this was likely the biggest trout I’ve ever hooked in the Savage. I felt the trout dive to the bottom, and one more head shake was one too many. The only thing worse than losing a big trout is not even getting a glimpse. I went back to fishing dries, and ended the day with 9 fish in the net. March browns, caddis and a few sulphurs hatched in small numbers, but I never saw any rises until dark. Wednesday I took two rods down to a middle section of river that gives up some nice fish. I went through with dries, and than with nymphs, but only picked off two decent browns. I moved back up to the upper sections, and fished the same dry fly all day. I covered a lot of ground, and caught the triple combo; brookie, brown and rainbow trout. I had two 15 inch browns all the way to the net, and just popped them off. I moved down to a flat before dark, and had an encounter with the smallest fawn I have ever seen. It made a run toward the river, and I set my rod down to take a picture. I moved down river, and the deer doubled back. It ran clumsily right at my rod, but stopped a foot short of trampling it. I snapped a pic of this tiny deer, which was only as tall as the first stripping guide. I didn’t see any risers in the flat, and moved into choppy water. Before it got totally dark a few hendricksons, march browns and sulphurs hovered over the river. I left the water with 9 fish landed, quite a few misses and break-offs. On Thursday I hiked up through one of the lowest sections of river. I wanted to nymph, and quickly caught a half dozen bows on a size 14 pheasant tail. I picked up a couple of nice browns and brookies on a larger rubber legged nymph. In the afternoon I went back to dries, but since the levels had dropped 100 CFs, the fish were not nearly as aggressive. The fishing was still very good, and my total landed hit 14 fish. Plans to wait out the last evening for a spinnerfall were abandoned after thunderstorms chased me off the water. I slept in late and hit the road on Friday. The latest video post features some river shots, insects and some trout I caught on the Savage. This entry was posted in fishing report, video on May 28, 2011 by Jason du Pont. The Gunpowder river is flowing at 153 CFs, is clear and 52 F. Seasonally warm water temps influenced by surface water spilling over the dam have been moderated by a change in release earlier in the week. This means cooler water is now flowing into the plunge pool from lower levels in the reservoir and allowing the fish some breathing room. If you’re heading out early, unweighted pheasant tails sized #16 are a good bet. Small elk hair caddis fished in the riffles between Masemore and York Road have accounted for a number of fish this week. Try swinging snowshoe rabbit emergers and partridge caddis patterns. Have a safe weekend! We just received a shipment of Simms Streamtread Vibram soled boots, Chota Rocky River rubber soled wading boots and Blue Ribbon Nets with the new Aquafade bags. Shop Hours are 10 till 4 Saturday, Sunday, and Monday from 10 till 4. Stop on in and see the show! This entry was posted in fishing report on May 27, 2011 by Theaux Le Gardeur. Sulphurs Won’t Wait…Bring a Rainjacket and Get Fishing! 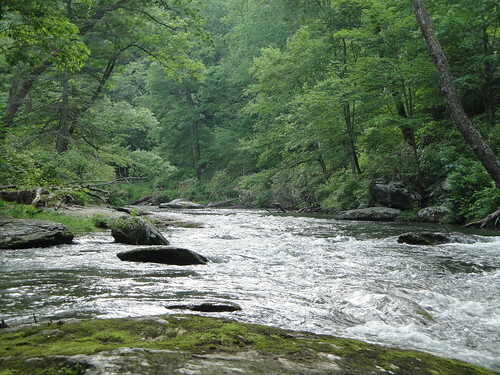 The Gunpowder river is flowing at 145 Cfs, is clear and 62.7 degrees. If you listen to the weatherman you might end up in a mall for the rest of the Sulphur hatch. They’ve been coming off since the first week of May and by most accounts our wet spring has made it very tough to get any fishing on a consistent basis anywhere else in the Mid-Atlantic but the Gunpowder. We’ve only missed four fly fishing days since January owing to high flows. This month, water temps along the river have been much warmer than average and the fish are responding favorably. Nymphing with unweighted Pheasant Tails and Hare’s Ears sized #14 through 18 is a safe bet in the morning. Sulphur duns, mostly in the #16 range with a few #18’s in the mix are peeling off as the sun pops out between clouds. Caddis in #16 to #18 range fished across the riffles have been the ticket between hatches. Warmer evenings have had more consistent spinner falls, (Mike’s paraspinners are in the muffin tins) and a late emergence often occurs closer to dusk so bring along enough varied fly patterns including emergers, duns, spinners and cripples to let the fish decide. The message is that the Sulfurs won’t wait, bring a rainjacket, use some 6 and 7x and enjoy some of the nicest flows and temps we’ve seen of late. I was able to bring my father in law to the Gunpowder yesterday. He is 75 and is still able to handle a fly rod better than most half his age. I was hoping the fish would be cooperative. We got on the river around 3:00 pm and fished until a storm chased us away around 7:15. We each caught 3 browns. All were caught while swinging emergers with a nymph dropper just as you recommended. At the start the fish hit the nymph. Closer to evening the emerger became more popular. The flies you had were exactly what we needed. The browns were definitely on the hunt. While we landed 6 fish we had probably 12 other strikes to the swung flies that weren’t quite solid enough to stay hooked. When swinging flies like this, it is amazing how many strikes come when the fly has swung completely downstream and is allowed to sit for a few seconds. Thanks for your advice. We had a great time. Stream Report Update: Expect higher water this afternoon owing to an increase in flow from the dam. This entry was posted in fishing report on May 24, 2011 by Theaux Le Gardeur. 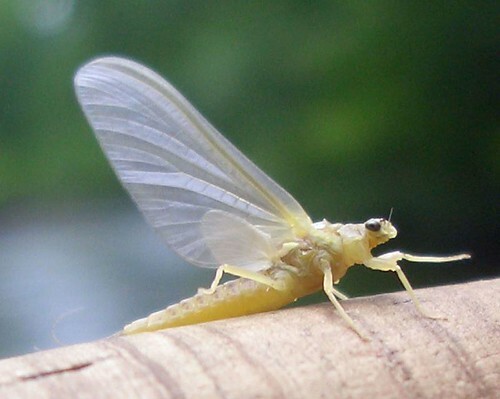 The Capital ran an article titled; Whirling Disease in Trout Bought for Stocking following a Maryland DNR press release about the Whirling disease infected stocked fish. All told, fish were stocked in five Western Maryland streams. 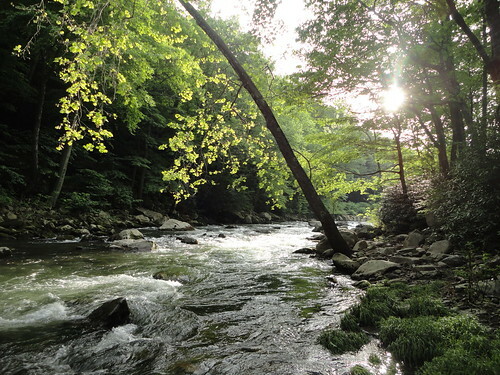 The Maryland Department of Natural Resources said whirling disease has been found in a delivery of 8,000 trout stocked in several western Maryland streams. 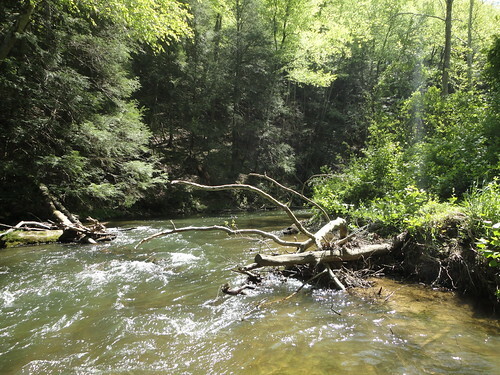 The department announced Thursday that DNR staff stopped stocking on May 11 after suspicious behavior was observed in fish being placed in the North Branch Delayed Harvest Area, Evitts Creek, Jennings Run and Sidling Hill Creek. This entry was posted in news on May 23, 2011 by Theaux Le Gardeur. 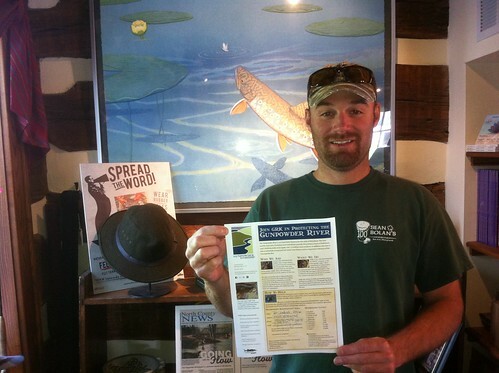 Pictured above is Alex McCrickard who worked in the shop as a high school intern for two years, had an article about the Gunpowder River published in Fly Fisherman and is now headed to Wyoming this week to guide fly fishing trips on a ranch six days a week through August. You probably saw this already, but in either case, it is a shame to see a local fly shop close. And Kaufmann’s; talk about an institution! Glad to see you hanging in there through the recent tough economic times. It would be a shame to lose the products and services you provide Thanks. On a related and somewhat more local note, we just lost White Clay Creek Outfitters in Wilmington, DE. The shop’s last day of business will be May 29th. These closures are real folks and with them goes the knowledge base centered around the streams that the shops focus on. Shops are made up of staff and customers as much as the featured products. With that said, we are truly thankful for our regulars and welcome new folks to stop in to the shop to catch a glimpse of the beauty of the Gunpowder River through our eyes. The closing of Kauffman’s and White Clay is a not so gentle reminder to shop where you get your stream report. Clouds of mayflies weren’t the only clouds hovering over the river this week. Heavy rain the past few days caused the Gunpowder to hit nearly 600 CFs, and steadily rising as a light rain falls in Monkton today. Current USGS reading at Falls Road today is 596 CFs, and climbing straight up. A good possibility of thunderstorms later today and tomorrow means anglers should check the gauge before the weekend. 100-300 CFs is wadeable, although anglers should be cautious on the higher end of that range. 300-400+ CFs has limited wading options, but fishing is still possible from the banks or shallows of wide flats. Flows over 500+CFs can be very difficult to fish, although a few sections still allow fishing streamers from the bank. Before all this rain the Gunpowder had dropped down to just over 100 CFs, and water temps in the low sixties. The fishing really turned on these past few weeks. The sulphur hatch is three weeks in and going strong. We ran many guided trips the past two weeks, and hit some great hatches in the evenings. The sulphurs start hatching in the morning and again between 3-6 pm. Swinging nymphs or fishing an indicator rig will catch fish through the middle of the day. Fishing snow shoe pheasant tails to the browns slashing at emerging sulphurs will entice the aggressive trout. Traditional dun patterns will get strikes fished blind in riffles and pocket water. The hatch fishing over rising trout in the late evening is pretty exciting. I encountered a few heavy spinnerfalls, where the bugs numbered well into the hundreds, if not thousands. On two evenings there were “too many” bugs, a situation where the trout became tough to catch with all the naturals floating past. I was guiding, so I didn’t have my camera to film the hatch. One evening I finally did film a big cloud of spinners, as they returned to the water. Unfortunately, my camera does not focus very well on tiny objects flying through the air, nor does it do well in low light conditions. When I got home the footage was far less clear than witnessed first hand, but even in the slightly grainy shot, it is obvious there are a lot of mayflies in the air. The latest video post shows why staying late on the water can be worth the hike out in the dark. This entry was posted in fishing report, video on May 19, 2011 by Jason du Pont. 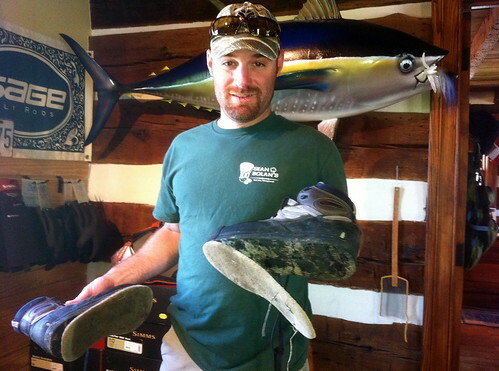 The Maryland felt soled wading shoe ban wasn’t the only reason that prompted Gunpowder and Chesapeake Bay Light Tackle Fly Fishing Guide Capt. Jeff Lewatowski to pony up for some new kicks. Clear water, great flows and lots of rising fish and hatching insects certainly played a part and allowed him to run some fun, fish-filled trips on the Gunpowder river this past week. After purchasing a pair of Simms Streamtread Vibram Rubber Guide Boots, Capt. Jeff joined Gunpowder RIVERKEEPER®, (GRK) as a member at the Protector level and proudly slapped a GRK bumper sticker on his ride! 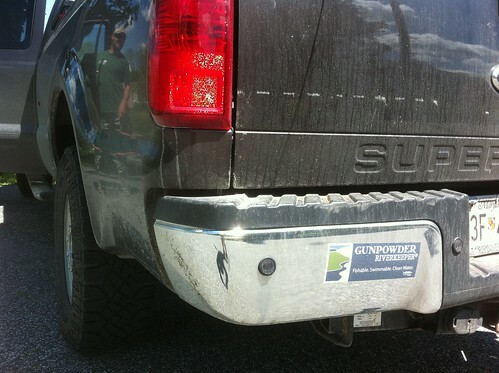 Join Gunpowder RIVERKEEPER®, (GRK) today and let everyone on the beltway know you are riding for the brand and as a member, are protecting the resources of the Gunpowder River Watershed. This entry was posted in news on May 17, 2011 by Theaux Le Gardeur. Many Gunpowder regulars will recognize that Josh has been part of the scene at BWA since the Holidays. For those of you who have not fished the river since last year’s sulphurs, Josh brings good tidings in his first stream report. Between putting in time at Hereford High, Backwater Angler on the weekends and lacrosse practice he manages to fish more than most and is happy to share his knowledge! Just went out this past Sunday downstream of Masemore. By the time that I arrived in late afternoon the river was packed with fishermen and hikers. However I think the weather scared some of them away, by around 6:30 PM everyone had left, it was an empty parking lot. The best advice I could give anyone would to be too not leave, to stick it out and fish until dark. For the first time this year I saw a SULFUR HATCH! It only lasted about 10 minutes but it was a great sight to see that we are moving closer and closer to summer. There were also plenty of caddis coming off towards dark. Many fish were smacking the surface violently to get the bugs. I ended up catching 5 in the couple hours that I fished; two were on streamers, a silver flash wooley bugger and a brown rabbit strip zonker that I picked up at the shop the day before. The other 3 were caught on a spent wing caddis pattern tied by Mike Bachkosky. It is a great pattern tied with snowshoe rabbit wings, size #16. Even with the high flows around 187 CFS, bugs and fish remained active! As next weekend approaches, I expect to see the number of Sulfurs increase dramatically. Don’t go out on the river without 7 main flies; Sulfur Duns, Sulfur Spinners, Elk Hair Caddis, Spent Wing Caddis, Caddis Pupae, Softhackle Pheasant Tails, and Wooley Buggers. With this fly selection you should be set. 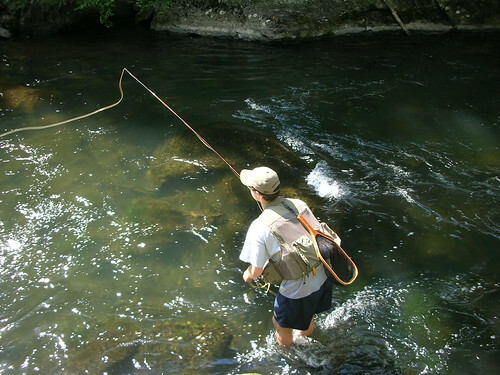 Make sure to fish the riffles hard, and sneak up on the flat water watching for rising fish. Looking forward to seeing everyone on the river! This entry was posted in fishing report on May 16, 2011 by Theaux Le Gardeur. Please join us for a flyfishing school. On Sunday, May 22, a Backwater Angler Guide will be teaching a fly fishing school that is ideal for beginners. If you’re planning on fly fishing in Maryland, or anywhere else for that matter, this course is a great introduction to the sport. The school covers knots, casting, gear, fly selection and an hour of on-stream instruction. Schools are held in a meadow overlooking the Gunpowder river by a Maryland state licensed and insured fishing guide. Class is held from 11:00 AM till 2:00 PM. Cost is $100 per person and includes the use of gear. A Maryland non-tidal fishing license and trout stamp is required and may be purchased prior to the class with check or cash at the shop. Class size is limited to 4 and pre-payment is required. Please give us a call at 410-357-9557 or drop us a line at info@backwaterangler.com to register. This entry was posted in events on May 16, 2011 by Theaux Le Gardeur.